Blackjack is a fun and relaxing way to unwind after a busy week. This week Intertops’ Poker and Juicy Stakes want to get the weekend off to a winning start by topping up everyone’s Blackjack wins Friday evening during Blackjack Happy Hour! Both online casinos are well known for their busy poker rooms but they also offer slots and table games from World Match, Lucktap and Betsoft. This Friday, June 30th, between 7:00 and 10:00 pm Eastern, they’ll both be adding an extra 5% to every Blackjack win. 5% added to all Blackjack wins 7 - 10 pm EDT, June 30, 2017. To receive your 5% Blackjack bonus, just play any of their three Blackjack games: Blackjack, Double Draw Blackjack and Perfect Pairs Blackjack. (Blackjack in Intertops’ main casino does not qualify for this promotion.) Whenever you win, the casino will automatically add an extra 5% to the pay out. It will be paid to your bonus balance and is subject to a 15X play through requirement. You can win up to $250 in extra Blackjack winnings! Intertops Poker players will find further details at https://poker.intertops.eu/en/promo/226-blackjack-happy-hour. 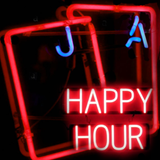 Details are also available at Juicy Stakes at https://www.juicystakes.eu/promotions/blackjack-happy-hour.